It seems that Malaysia is in the top three as far as trade volume with China, after Japan and South Korea. In fact the Malaysia-China trade volume is expected to cross US$100 billion soon. I'm interested to know out of this US$100 billion, how much is Malaysian exports to China vs how much is Malaysia importing from China ... Any guesses? 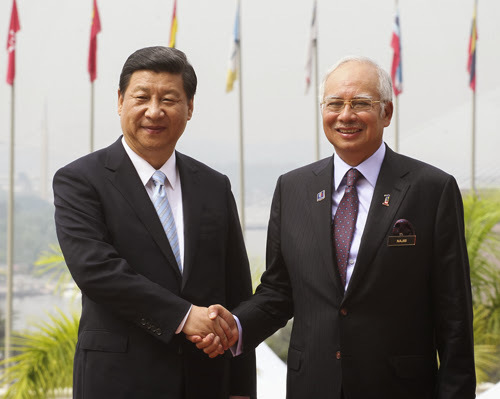 President Xi had discussions with PM Najib Razak. They agreed to significantly upgrade bilateral ties, boost military cooperation and nearly triple two-way trade. Both countries would also step up efforts to promote regional stability. Xi's trip to Malaysia and Indonesia (where he will attend the APEC conference in Bali) is seen as a "charm offensive" - an attempt by Beijing to gain some leverage over ASEAN - especially over the handling of territorial disputes and also to counter-balance Washington's so-called pivot to Asia. With President Barack Obama needing to scrap his Asian tour due to the US government shutdown (due to his standoff with the Republican Party), Xi's meetings with regional leaders in Asia have grabbed the limelight even more.